Back in 1969, James Bond, also known to millions as 007, was doing what he is always doing – saving the world. But this time, it was different. In addition to saving an imaginary world from imaginary villains, Bond managed to save a real-life Swiss company from all-too-real financial ruin. A small Swiss company, Schilthorn Cableway Ltd. had a very big plan to build the longest cable-car line in Europe in Bernese Alps, located in western Switzerland. This areal line would start in the small village of Stechelberg, jump up to the villages of Gimmelwald and Murren, and after passing an intermediate station at the summit of Birg, end its breathtaking ascent at the summit of Schilthorn located 2970 meters above sea level. 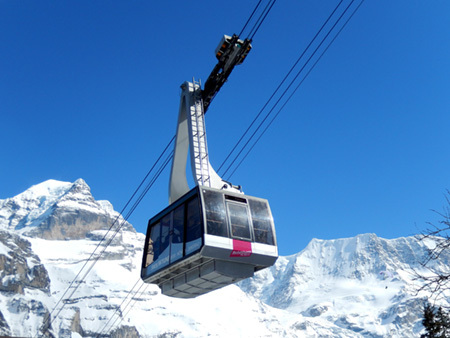 Passengers traveling all the way to the top would change cable cars 4 times and would be reworded with a fantastic view from a revolving restaurant crowning the Schilthorn. 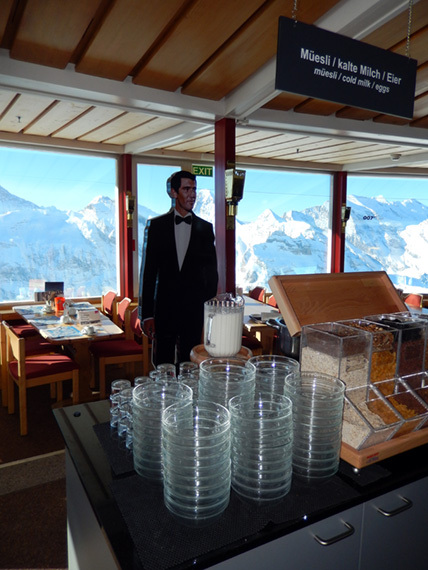 James bond played by George Lazenby, his one and only 007 role, greets visitors of the revolving Piz Gloria restaurant. This aerial line would provide quick and easy access to some of the best and most challenging ski slopes in Europe, picturesque Swiss villages, and numerous mountain tracks. The original project budget estimated at 8.5 million Swiss Francs was secured and constriction began in 1961. The first three sections connecting Stechelberg to Gimmelwald, Gimmelwald to Murren, and Murren to Birg were completed and became operational in the spring of 1965. By that time, the estimated cost increased up to a staggering 25 million Swiss Francs due to unforeseen technical difficulties, severe weather conditions, and inflation. The company ran out of money and was seeking another loan. 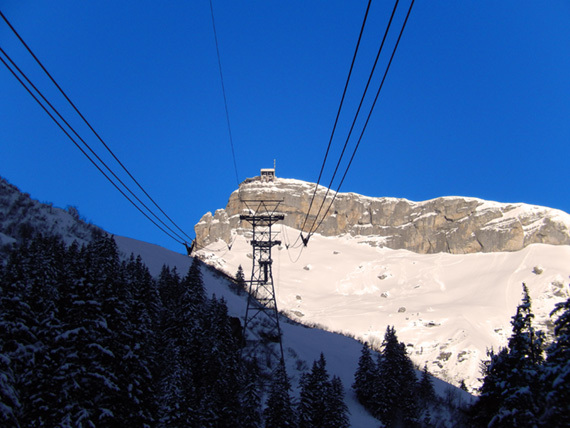 The loan was secured, and the last section connecting Murren to Schilthorn was placed in service in June of 1967, in spite of Schilthorn Cableway Ltd. losing money at an alarming rate. 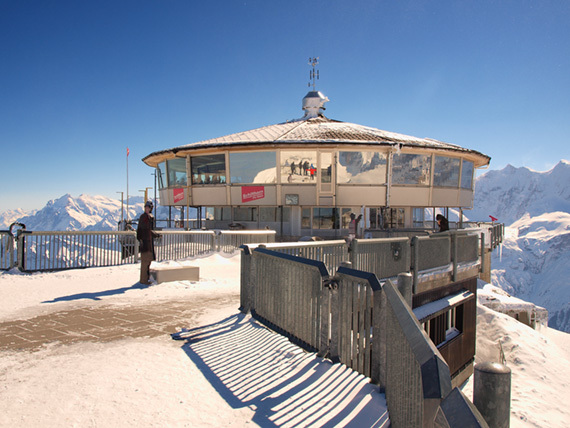 The construction of the revolving restaurant stopped, and the financial situation looked bleak until Hubert Fröhlich, the production manager of the future James Bond movie, “On Her Majesty’s Secret Service,” came upon the unfinished restaurant at the top of Schilthorn. Fröhlich had been location scouting in France and Switzerland, and he finally found what he liked best. “On Her Majesty’s Secret Service” was based on Ian Fleming’s book with the same name, and featured a little known actor George Lazenby as the legendary 007, following Sean Connery’s decision to end his Bond career. The plot centered on a mountain-top allergy treatment clinic named Piz Gloria, where the villain, Ernst Blofeld, was developing his plans to bring the world to its knees. The landscape also needed snow covered steep slopes to stage acrobatic downhill ski chases and picturesque Swiss villages. Film producers Broccoli and Saltzman liked the idea of turning the yet unfinished restaurant building at the top of Schilthorn near Murren into Piz Gloria. The production company Eon Productions ended up financing not only the completion of the restaurant, but bringing in electricity and finishing other construction necessary for shooting the movie. 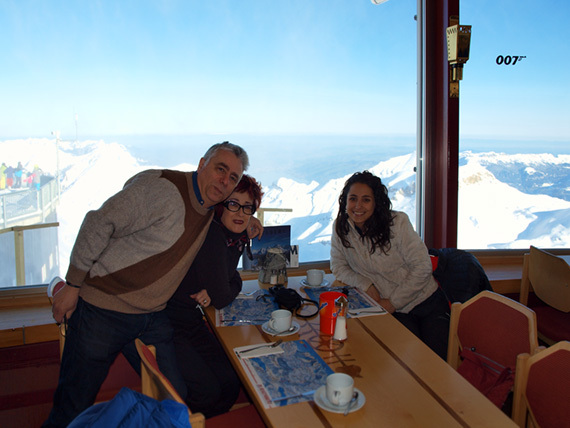 After filming at Schilthorn was completed in March of 1969, the Schilthorn Cableway Ltd. owed nothing for finishing the restaurant and other structures in exchange for the rights to film on its premises. The name Piz Gloria stuck and became the restaurant’s permanent name. Filming continued in the UK and Portugal and the movie was released in December of 1969. After a successful release and several re-releases, “On Her Majesty’s Secret Service” grossed over 82 million US dollars worldwide. So financing the completion of the restaurant was worth every penny. As for Bond, Lazenby decided that he had done enough spying and told the producers that “On Her Majesty’s Secret Service” was his first and last James Bond movie. Ready for breakfast at Piz Gloria rotating restaurant. I think we had the table where James Bond drank his martini. Four sections of the Schilthorn cable car line will take you to picturesque villages of Gimmelwald and Murren, on to the intermediate station of Birk and finally to the summit of Schilthorn. This entry was posted in Art and Artists, Europe, General and tagged Alps, James Bond, Murren, Piz Gloria, Schilthorn, Swiss Alps. Bookmark the permalink. Nice pictures, Alex. Well-done article. I also took a cable car to the top of a mountain in Switzerland, but it was a different place, a resort, I think. I returned by tram. This was in the 1990s. Keep up the good work. Best, John.